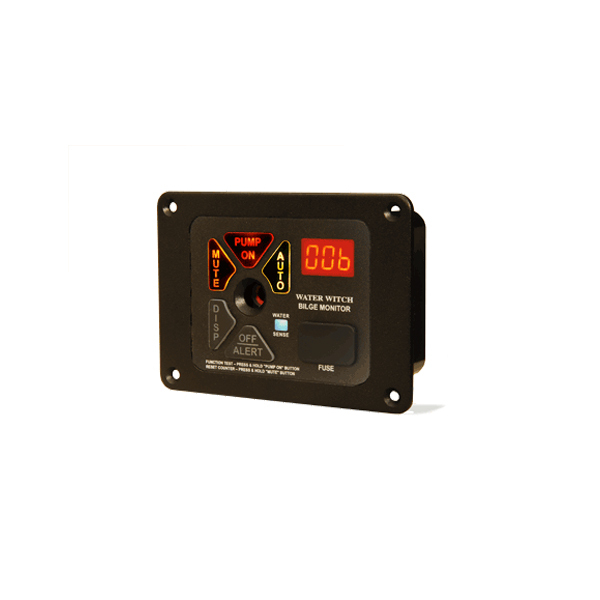 Model BA200 Bilge Monitor – Water Witch Inc. The new BA200 is a hybrid panel combining all the best features from our technology. With a built in alarm, the BA200 is not only a bilge pump monitor but also a counter and control. In one panel, the captain can easily monitor the bilge or with the touch of a button, engage the pump. With 3 built in modes, Auto, Alert and Manual, you chose how you want the control to respond. Counter– The BA200 keeps a 2 week history of pump cycles and displays a grand total, followed by how many times the pump cycled in the past 24 hours, 7 days and 14 days. Also, the BA200 tells whether power has been interrupted by flashing the display indicating the count for that time period may not be valid. Alert Mode– The default mode when first powered. The water sensing light illuminates once water has been detected for more than 6 second eliminating the false alarms or incorrect bilge counts. If water is detected for more than 2 minutes, the audible alarm will sound. The Bilge Pump WILL NOT start automatically and must be engaged manually. Auto Mode– When engaged, the Auto button illuminates. When water is detected, the pump instantly starts and the pump count total is displayed. Audible alarm signals after 2 minutes of continuous operation. Manual Mode– Pressing the pump on button engages the the bilge pump. The button lights up indidcating that the pump is running and will need to be turned off. There is no audible signal in manual mode. The Mute button will silence the audible alarm but the button will continue to flash as a reminder. If an alarm condition is not resolved after 7 minutes, the Monitor will unmute and continue to sound the audible alarm.